After a long day of peaceful demonstrations against tuition hikes, yet another nighttime protest ended with smashed windows, tear gas and many arrests, with last night’s total reaching 122. Hundreds of protesters met at Place Emilie-Gamelin at 11 p.m., just as another large anti-tuition march was arriving. After converging on the square, about 2,000 people began marching west, into downtown Montreal. “Douchebags dans la rue!” chanted some protesters as the protest made its way down Crescent St., mingling with bar patrons and attracting a mix of applause and shouted abuse from the packed terrasses. Buses of riot police, lights flashing, sped through a laneway behind the street, surprising a group of drunk, urinating men who hurriedly zipped up their pants and ran. The mood turned ugly as the march moved onto Ste. 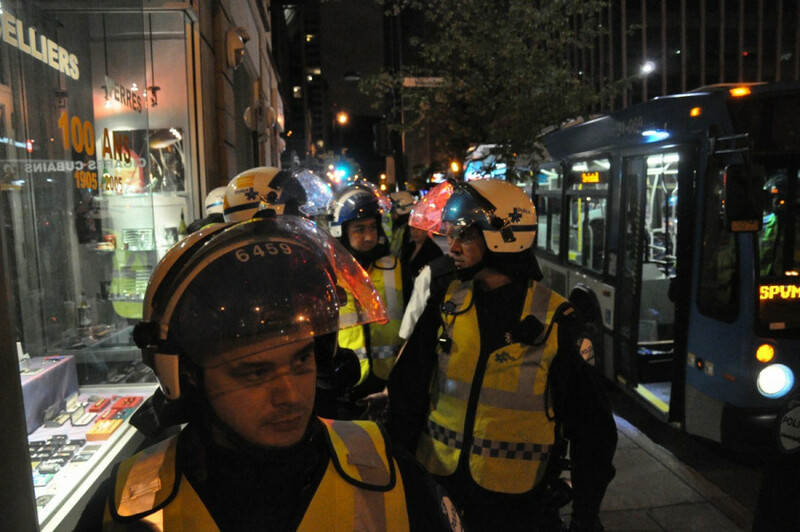 Catherine St., where an altercation between several protesters and at least one bystander prompted police to intervene. Masked protesters smashed several bank windows and tossed objects at police. Shortly after announcing that they had declared the protest illegal, police charged into the crowd, splitting it in two. They made several individual arrests, including one, unrelated to the protest, of an apparently inebriated man who heckled police while walking through the bike lane on de Maisonneuve Blvd. 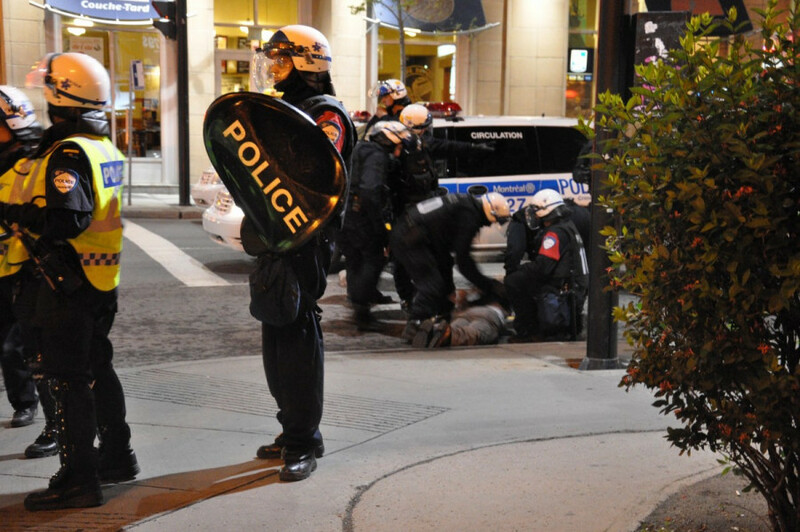 at de la Montagne St. As officers piled on top of the man to cuff him, his discarded tall can sprayed beer in the air. Police surrounded and arrested a group of about 20 people on Peel St., just south of de Maisonneuve Blvd. Although the group appeared to be obeying police orders to disperse and keep to the sidewalks, riot officers rushed down the street and kettled them. The group included at least five confused American tourists, who said they had been returning to their hotels. Six of the 122 arrestees will face criminal charges, while the rest received bylaw tickets for “minor infractions,” according to The Gazette. 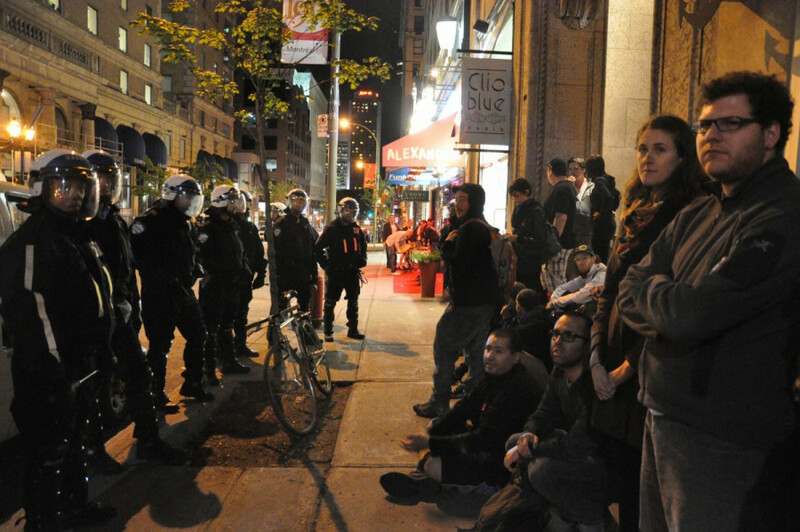 Also arrested were five journalists from The Link and The McGill Daily, and three from La Presse. The La Presse reporters were released immediately. After some quick work by the SPVM’s media relations officers and the manager of the department’s Twitter account, the remaining five were also released.